I don’t know about you, but a dozen days into January is a little bit too early for me to think about filing my tax returns. (Ned Flanders, of course, would disagree.) But the presence of Intuit on the Expo show floor snapped me out of my No Thoughts of Tax Returns Until the W-2s Start Arriving bubble—at least while TurboTax product manager Rich Preece was walking me through the changes in this year’s version of Intuit’s tax preparation program. The new release continues this new tradition of Mac-only features. The highlight this year is a bookmarks feature, aimed at making it easier to go back and add data to your return if that information isn’t immediately available. Here’s how it works: Let’s say you’re filing a joint return, and you don’t have your spouse’s social security number readily available. Add a bookmark to your TurboTax return, which creates a reminder in iCal—an event with a date you specify. If you’re a MobileMe subscriber, you can push that reminder to the cloud where it’ll sync up with your iPhone. Once you have the data you’re looking for, type it in on the phone and, after another MobileMe sync, the information will appear in the bookmark back in TurboTax. You’ll have to enter it on the form itself—Preece says that’s so that users double-check entries before adding it to the return—but the data is now readily available. It’s easy to access, too—bookmarks appear on the left side of the TurboTax screen, and you can click on them from anywhere within the application. A featured introduced to the Windows version last year makes its way into the Mac edition of TurboTax as well. The application adds a Live Community feature in which you can get answers to tax questions from TurboTax employees as well as fellow users. The idea behind Live Community is that whatever question you have about your return, it’s likely been asked—and answered—by someone before. Live Community draws on the experiences of some 4 million customers and TurboTax professionals, Preece said. Users give a thumbs up or thumbs down to advice based on whether it’s helpful or not, with responders earning points for each thumbs up. “It’s a little like getting rated a great seller on Amazon,” Preece said. Users can follow relevant Q&A sessions, asking that they get an e-mail any time there’s an additional answer. The new version of TurboTax streamlines things for the 60 percent of taxpayers who take the standard deduction, asking them fewer questions and letting them complete the returns faster than users with more complex tax situations. Intuit also enhanced the Audit Risk Meter feature introduced last year, adding more flags for things that trigger audits. 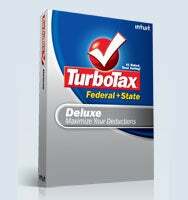 Intuit’s TurboTax site has more information on the four desktop versions available to Mac users as well as its assorted online offerings. This year, Intuit is touting its online edition for 1040EZ and simple returns, which gives you a free federal return, plus free e-filing.